MUFF WIGGLER :: View topic - Yamaha CS15 with Broken Key Assigner? Just Make a New One! Yamaha CS15 with Broken Key Assigner? Just Make a New One! Alas my CS15's original key assigner won't work. 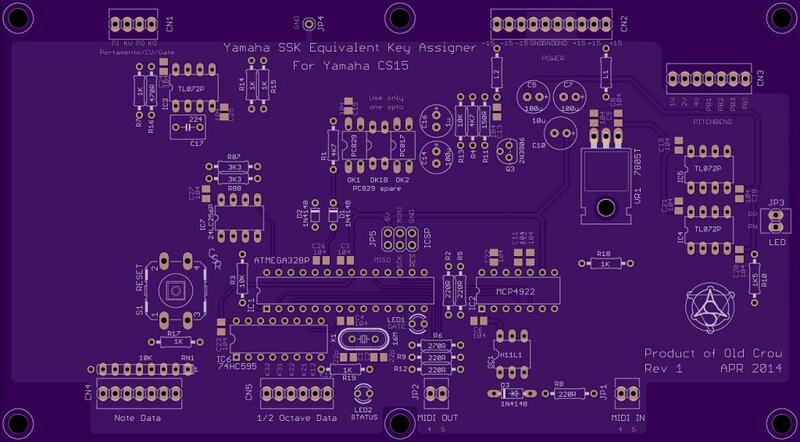 It is one of those Yamaha YM24800 custom chips that is part key encoder logic, part analog switches. The YM part encoded 37 keys as six groups of six plus the low C. It also made octave and note DACs out of resistor strings hung off the analog switch pins. The thing was clocked by a 10KHz free-running oscillator and it would output a gate that was +5V (key up) and -10V (key down). The obvious choice for replacing all of this is of course some kind of microcontroller. While I have spent the last 30 years doing embedded system designs, mostly for industrial PID controllers, all of my code tends to be written in assembly for Zilog Z8s and Microchip PICs. I have a sort of familiarity with C, but it wasn't my embedded language of choice because compiled code with 2.5 microsecond instruction cycles (an 8MHz Z8 from say 1990) was slow. 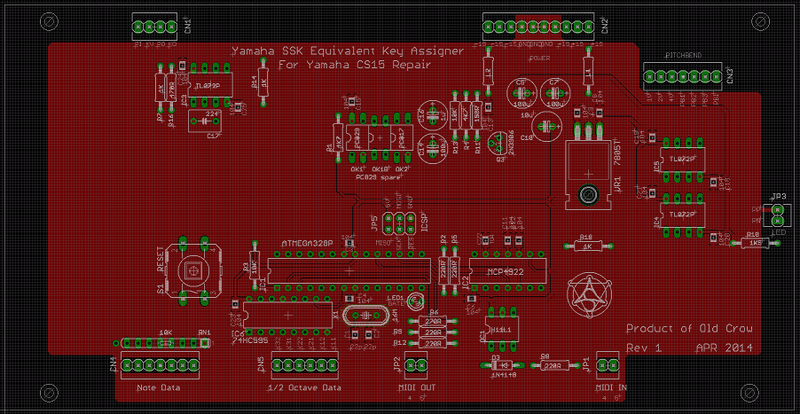 Yes, the layout is very sparse for the board dimensions, but this thing is meant to be a drop-in replacement for the old SSK board, which means ideally it uses the same mounting anchors and has the connectors in positions close to where they were on the SSK as the cable harnesses are all dressed and bundled to expect those locations. I had to come up with a new DAC method as I was not about to make one (two, really) out of dozens of 0.01% resistors. The problem is the CS15, like most of Yamaha's gear, is a V/Hz response and linear DACs aren't so great at exponential output. You can get one or two octaves reasonably well, but each octave down can only use half the DAC code space of the previous octave and soon the resolution errors become too great to obtain the desired pitches. So I had to devise a method of using one DAC to select octaves, which uses 4 out of 4096 possible (12-bit) DAC codes and a second DAC to select note values, using 12 out of 2048 DAC codes. Alas, the note DAC cannot span the entire range (I'd need a DAC where I can set the -Vref as well as the +Vref for that) but 11 bits for 12 semitones is fine. It is in fact good enough to allow loading micro-tuning tables eventually. But the DAC fun is not over just yet. The CS15's pitchbend voltage originally set the YM24800's DACs Vref. So, I do the same thing, the pitchbend voltage sets the octave DAC's Vref. In order to have the note DAC ratiometrically scale to the octave, the output of the octave DAC becomes the Vref of the note DAC. So this chain of pitchbend CV->oct CV->note CV ultimately gives me what I wanted. If folks ever wondered why I made expo response CS VCOs and filter, this is why--it avoids all this exponentiation on the control end. The +5v/-10v gate signal is done with an opto-isolator. I have a pile of PC829s, but I provided for using an PC817 too. It seemed academic to add the hardware for MIDI. The code for it is another matter, but there are many example out there in Arduinoland and I figure I can adapt something. So awesome!! Would it be a similarly feasible to do up the YM26600/YM26700? you are a farkn legend! My CS-15 is still fine, but very pleased to know there are solutions available other than landfill. Wow! Any chance you'll be doing a run of these for sale? Well if you ever do, you've got a tester with a 50 and 60! One note: the CS15 service manual shows the wiring for the DC power to the SSK as "+15 YE" (yellow) and "=15 BR" (brown). THIS IS WRONG. +15 is brown, -15 is yellow. Fortunately I had this thing on my current-limited power supply set down to 100mA. (The YM248 chip was dead before this incident, btw). Everything still works, though Yamaha's brilliant decision to use 16V electrolytics on 15V rails means I am replacing all of them with 35V ones. I will be replacing all the opamps too. Meanwhile, This thing is in the soup, probably have it next week. Out with the old, in with the new. Yamaha has these oddball rectangular pin headers I had to transplant (not 0.025" square). Everything seems to work. When I get the MIDI IN code done I'll throw stuff up on cs80.com. Excellent, wish someone thought it was worth the time to do something for the analog Electones as well, my D85 has 7 CS filters in it, but all midi options involve either level shift or triggered switches for every key. I have an Electone EX2. Wavetable oscillators, analog filters and digital EGs. One day I might do something for it. I have the MIDI input finished. It uses an 8-note buffer to store a multiplicity of keys so as to be able to do note trilling, etc. Other modes I will tinker with later. Now I have to figure out what is bugged on my synthesizers.com QKB15S keyboard: some of the MIDI outputs are just strange. If anyone has this unit, as an example does pressing E3 and holding it, then pressing D#3, D3,or C#3 cause the 2nd note to not transmit a MIDI message? Either the unit's microcontroller is broken or the firmware is buggy. There are other odd MIDI message outputs on other keys, too. For those interested, I tossed the project files up on github. Oh man! I just saw this on sdiy. Thank you. 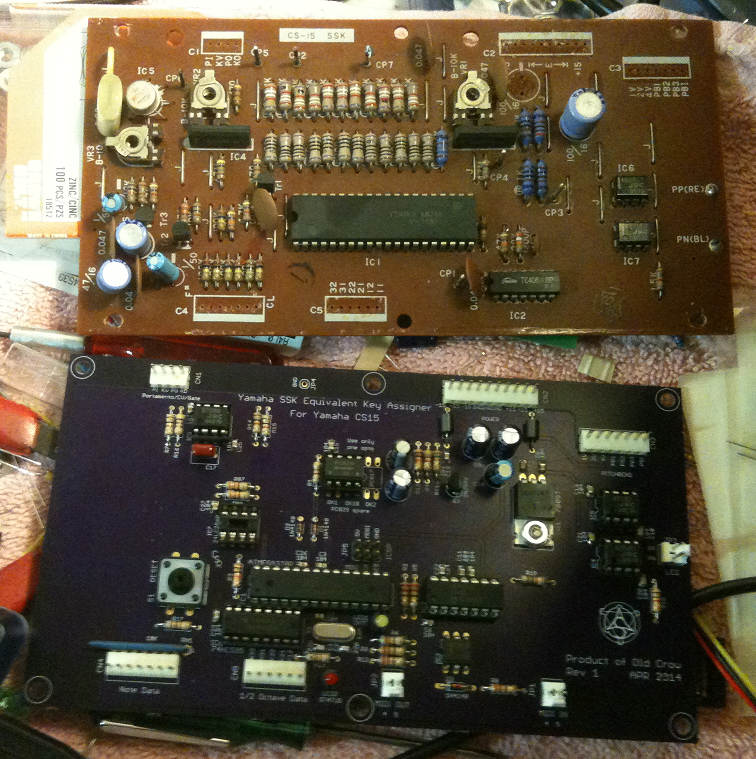 I just fried the SSK board on a CS-15 I was working on, all due to the fact that the original service manual leads you to hook up the +15 / -15 V connections BACKWARDS (as was mentioned by oldcrow). And then, of course, I found this thread. Let me just say.... Thank You, oldcrow! So, that said, I will be doing a run of three of these boards (the minimum order at OSH Park) that have been so expertly designed by oldcrow here. It's already been sent to the fabricator, and they should be sent to me around August 20th. Point being, if there is anyone else who needs one of these boards, please PM me because I'll have two extra ones that I am willing to sell for $50 USD each. Free shipping within the US. International shipping would be possible, but you would need to pay whatever it costs. And - of course - thanks again oldcrow!!! That is what open source hardware is all about. I might offer bare boards at some point, but it would be a more general version that can encode a 61-note keyboard and operate as V/Hz or V/oct. Ah, thanks for the heads up on the power oldcrow. What is the simplest method of getting this code on the ATMEGA328P? Do I have to buy a specific Arduino to do this? you could just get an arduino UNO with the socketed m328 on it, and program it with that. then take the chip out and put it on the board. otherwise you will need an isp programmer.